Connor Windows is committed to providing quality windows, doors, sunrooms, garage doors, railings, showers and duradek as well as professional services at reasonable prices. Our team of experts provides technical and practical advice so you can make informed decisions whether renovating or building a new home. When it comes to energy efficiency and unique design we are the professionals you can rely on. Connor Windows is proud to have been awarded the best of Trusted Pros for the year of 2016 and once again for 2018 for Windows and Doors in Peterborough and Kawartha Lakes. Trusted Pros is the leading Contractor review website for customers to post reviews about work they have had performed. These reviews go through a strict validation process by the Trusted Pros validation team to ensure they are accurate and cut down on false and misleading reviews. Connor Windows is an approved member of E-Renovate approved by Enbridge. 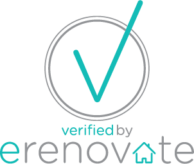 E-Renovate uses a verification process to ensure its members adhere to a strict code of conduct as well as use high quality energy efficient materials. Approved by Enbridge as an avenue to assist in finding local contractors whom will provide renovation materials that will improve the energy efficiency of your home.